Tonight I was walking with a few friends to get dinner. It was a chilly evening, and I was wearing my Manchester United jacket. I realized as we walked that one of my greatest (completely unfounded and irrational) fears stems from this jacket. I got the jacket as a gift for being in a wedding party years ago. While I don’t exclusively root for MU, I’m happy when they do well. Mostly I just like the jacket. In 2011, I took a trip to Ireland. Before I departed, I asked an Irish friend if it would be okay for me to wear my Manchester United jacket there. I figured it would be fine, but I had heard stories about the level of passion embraced by football fans in Europe (particularly in Ireland and the UK). To my surprise, my friend said that my fears were valid and that I shouldn’t wear the jacket! 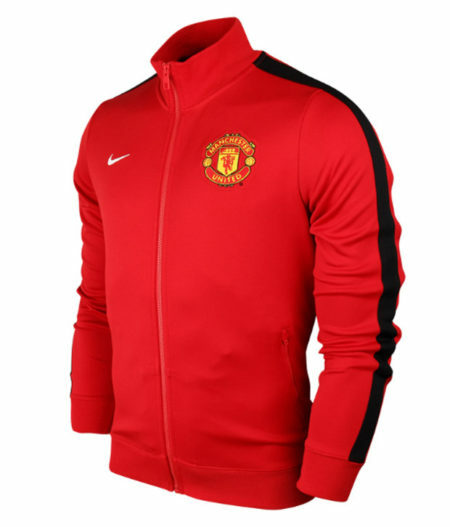 So ever since then, even in the US, I occasionally have a passing fear that a random stranger–perhaps after a few beers–will throw a sucker punch at me just because of my Manchester United jacket. Granted, nothing like this has ever happened to me, not even close, but it continues to be a passing thought. Have you ever seen a passionate sports fan take things too far? This entry was posted on Tuesday, March 7th, 2017 at 11:31 pm	and is filed under My Greatest Fear, superlatives and tagged with superlatives. You can follow any responses to this entry through the RSS 2.0 feed. As an american, they wouldn’t really care. Unless you went to Liverpool and entered a pub filled with Liverpool supporters, you would be safe. The worst you’d experience would be some comments about MU beeing trash. In america, i doubt anyone would suckerpunch anyone because of team affiliation. Unless someone wanted to suckerpunch someone, and needed a made up reason. I have sat in my West Ham jersey, next to other supporters in England, without any incident. Including all London teams, except Millwall. Thanks for sharing! It’s interesting that there are specific teams that really don’t like each other (to the point of harassment), but others don’t really care. Varying reasons but class, traditions and competition outside the game all contributed into making it. Both Liverpool and Manchester where big ports on the english west coast competing for the same contracts. The workers supported their local teams and thus “hated” the others for reasons outside the pitch. Initially anyway. It’s not as bad now though as it was before. That’s fascinating. I had no idea it went back so far. Yep I was at a charger game and when the chargers scored a touchdown we all stood , raised our hands and cheered and suddenly i buckled over from a sudden dull pain….turns out the drunk guy sitting next to me punched me in the stomach…like 4 quick left rights straight to my gut…I was surprised I held my cool but I did have him thown out for that…Ive never attended another game after that. Wow, I’m sorry to hear that Mark.